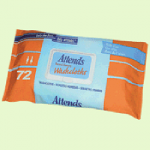 Put incontinence to bed with Attends Incontinence Products & Supplies. 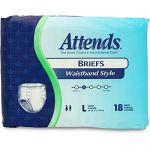 These briefs are designed with dignity in mind, and Sportaid is one of the biggest online retailers of adult diapers, briefs, and underwear from reputable brands, just like Attends. Spend your days with new comfort with our selection of Attends Briefs. Now there is no need to worry over involuntary loss of urine at unwanted and inopportune times. Choose the right fit for protection from Attends Briefs w/Waist Band, Attends Dri-Sorb Plus Underpads, or Attends Skin Protectant Washcloths, and wear them comfortably under most clothing without announcing to the world that you are wearing protection. The variety of sizes available at Sportaid.com makes it easy to find one that is just right for you. Select from the top manufacturers and save big with Sportaid.com's everyday low prices. 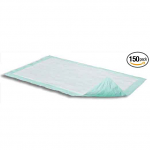 Browse through our premium selection of Attends Incontinence Products & Supplies or feel free to call 1-800-743-7203 for help choosing the right fit quickly and easily. You'll be glad you did! 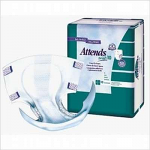 With savings as high as 36%, Sportaid is the place to buy Attends Incontinence Products & Supplies! Even if you are a new customer, you are welcomed with the same satsifaction guarantee we offer those who have been shopping with us from the beginning. After over 25 years in the business helping people find Attends Incontinence Products & Supplies at the lowest prices we continue to lead the industry! We carry a large selection of wheelchair cushions, wheelchair parts, and wheelchair accessories. We are capable of beating any competitor's advertised price, just call! Our customer service staff has over 50 years of experience, plus over 90 years of combined wheelchair use experience. We look forward to working with you!